Buffalo, NY – July 2017… Housed inside the renovated historic landmark Harlow C. Curtiss building located at 210 Franklin Street in downtown Buffalo, the Curtiss Hotel is a 5-star property that just opened to the public. Featuring 68 ultra-luxurious, high-tech rooms and breathtaking wedding, special event, and conference-style meeting spaces, the Curtiss Hotel’s amenities are unlike anything Buffalo has ever experienced. Hotel management was searching for ways to keep the community informed of the hotel’s activities, but city regulations limited their options. They then discovered the possibilities projection technology from Rancho Santa Margarita, CA-based Eiki International, Inc. made possible. Veraview LLC of Buffalo, NY, a full-service design / build AV systems integrator focused on collaborative technology solutions for corporate, education, and hospitality environments, was contracted to design and implement a digital signage solution that could be used to inform the community of the hotel’s events. Tom Sauter, the firm’s Vice President of Engineering, discussed the project and its challenges. Buffalo is, perhaps, best known for its challenging winter weather. Situated on the eastern shore of Lake Erie at the head of the Niagara River, the city’s ‘lake effect’ snow, wind, and freezing temperatures are legendary and not necessarily the most accommodating to electronic devices. To address these issues and keep the projector properly protected, Sauter housed the Eiki EK-800U in an enclosure from Tempest Lighting, a manufacturer of specialty outdoor enclosures for digital projectors and lighting equipment. It is constantly monitored for temperature and humidity conditions, and is heated and cooled year-round. 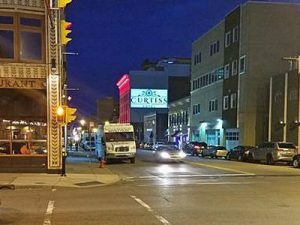 To learn more about the Curtiss Hotel, go to http://curtisshotel.com/. For information about Veraview LLC, visit the company’s website at http://veraview.com/..